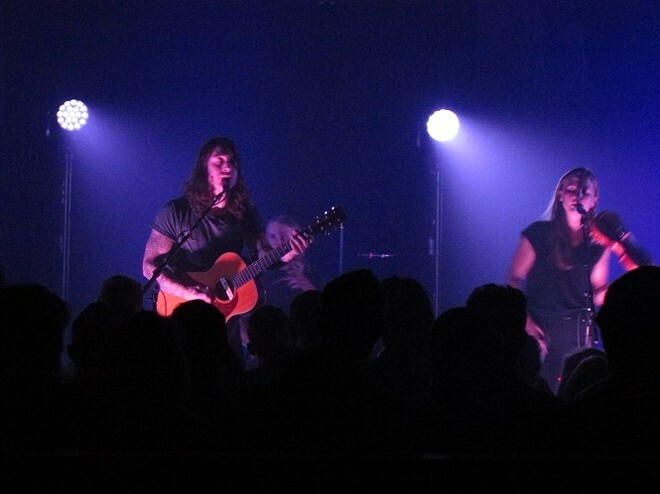 Wednesday night at The State Room, emotional genius Noah Gundersen and upbeat Seattle rock group Ivan & Alyosha turned a sold-out crowd into a bunch of introspective admirers. First, Ivan & Alyosha, who, by the way, are five guys, not two—and none of them are named either Ivan or Alyosha. Also, book-reading nerds out there, none of them are Russian brothers (though Tim and Pete Wilson are actual brothers). They are, however, a bit more like the Russian brothers Fyodor Dostoevsky wrote about in “The Brothers Karamozov” than they intended to be when they chose the name. The literary brothers represent the polar opposites of the notion of God, and the band’s newest album, It’s All Just Pretend, addresses themes of faith and religion. The songwriting has been diversified since their most recent album in 2013, All The Times We Had. Pete and Ryan Carbary started to write more, and although the two bring their own styles into the songs they worked on, the overarching sound remains good-natured and pleasant. “It’s nice to tour with a band that’s always happier than you—musically and actually,” Gundersen said of Ivan & Alyosha near the end of his set. When he took the stage, he looked more like an indie-emo musician attempting to hide his identity—the stage was covered in fog and one spotlight drifted through, over the shoulder of one of the members of the backing band. The stereotypical image conjured by a folk singer-songwriter when the artist’s name is his actual first and last name is a man sadly playing his guitar (which is named something like Lola or Madonna) and he’s sad and heartbroken and, scattered among his purple prose, he rhymes pain with heart vein. But that’s not Noah Gundersen. There are x different types of Noah Gundersen songs. That’s no mistake—I chose ‘x’ to stand in for a number of categories that I am unable to pin down because with every release, the man proves he has accomplished to portray yet another emotion. For example, type number 1: “Difference” and “Silver Bracelet” and “I Need a Woman.” This type is soft, sad, and acoustic and the way he sings sounds like he’s whispering; they reflect the feeling one gets after a hearty, body-shaking sob and you still feel blue, but have no energy to do anything but lie down in defeated exhaustion. And type 3: “Ledges,” is calm, spare and resigned, and the end was perhaps the most fragile moment ever created with musical instruments, with the lights dimming until the stage was black and echoing with the lingering sounds from the keyboard and harmonics from the violin. And I’ll admit, there were times when I put my pen and paper down because even though it’s my job to observe the musicians and everyone else swaying—the sound of their feet sticking and unsticking to the floor of The State Room audible over the sound that hung in the fog onstage—it was hard not to get sucked into the raw, emotionally exposed moment the musicians were having. It was a heavy transfer of emotions and it shows how nice it can be to feel sad.